When you launch the program for the first time, the Scale dialog will be shown. After you specify the right scale of the drawing then the main dialog will appear immediately. 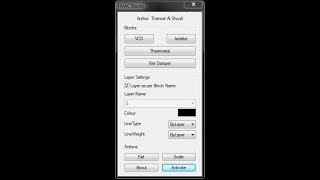 The main dialog has the option to set the desired Layer name, LineType, LineWeight and choose the desired block etc. The 'Change Scale' button in the main dialog changes the scale, if you have chosen the wrong scale from the first dialog that appeared at the start of program. NOTE: You need to specify the scale just once then the next time you open the same drawing the first dialog for setting the scale won't appear, as long as it is already set.